“This is the story of the life and daydreams of Mevlut Karataş, a seller of boza and yogurt.” Thus begins A Strangeness in My Mind, the story of a 12-year old boy who moved from central Turkey to Istanbul and the concurrent story of that city from 1969 to 2012. We learn the bones of his story quickly. He joins his father in Istanbul in an effort to seek his fortune by selling boza, a sweet and sour Turkish drink, on the street. After a poor school career and a few years in the army, he elopes with Rahiya, the sister of the woman to whom he had been writing love letters during the three years he was in the army. He has many jobs but gets no richer. He does not fit in, the proverbial hayseed come to town. His only constant job is selling boza and yogurt, usually in the evenings while balancing a large bucket of the drink on either end of a wooden yoke—hard, backbreaking work. Mevlut’s story is the central focus and told by an omniscient narrator. That narrator tells the rest of the story through the voices of characters who are central to Mevlut’s life. These include his father and cousins Korkut and Sϋleyman. It was Sϋleyman who was part of the trickery that resulted in Mevlut’s marriage to the wrong woman. It was, nevertheless, a loving marriage and Rahiya is also one of those who comments on her husband’s story. The varying commentaries bring balance and depth to Mevlut’s story. 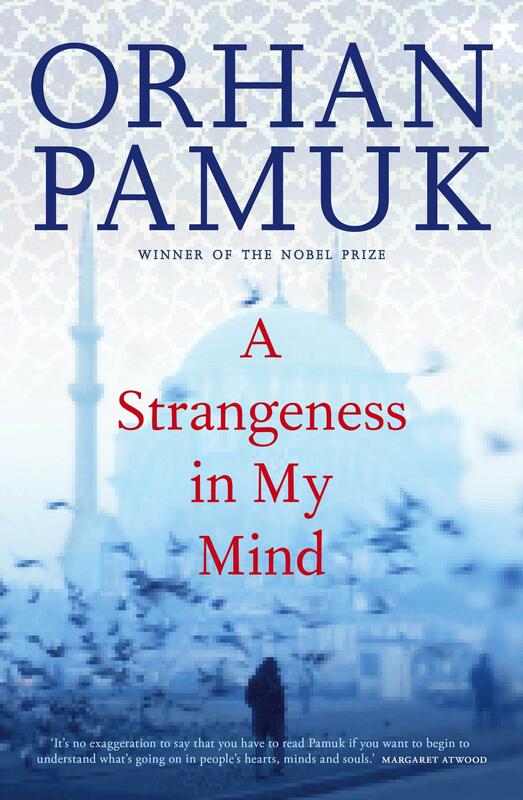 A Strangeness in My Mind is a story of a city and country which are experiencing growing pains physically, politically, culturally, and religiously as they struggle into a more modern world. The Sunnis and Alevis, the Turks and Kurds, the wealthy and poor, and the nationalists and communists are at odds with one another. All the while a wave of migrants, poor and disenfranchised, is creating a Dickensian underworld of uneducated squatters and day-laborers who are scuffling to survive. Mevlut is adaptable. Whether it is marrying the wrong girl or accepting a change in jobs, he clings to his sense of integrity as his world changes. A helpful family tree and chapter titles provide orientation to the story that is about to unfold. The end includes a very helpful character index, but the most appreciated feature, especially to those who are not intimately acquainted with the history of Turkey, is a historical chronology. The historical facts place the fictional “facts” into context. Mevlut is born in 1957. A few facts which resonate in the story will suffice. Greeks are expelled from Istanbul in 1964 in response to fighting between Greeks and Turks in Cypress. That caused many buildings to become empty which led in turn to an influx of Turks, such as Mevlut and his father, into the city. Sunni militants killed 150 Alevis in the Maraş Massacre in 1978. In 1994 Recep Erdoğan became mayor of Istanbul then prime minister in 2003. 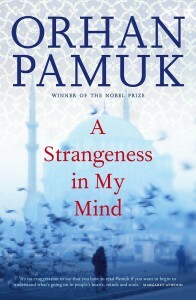 A Strangeness in My Mind is a soap opera with its twists and turns and interconnected relationships, but the beauty of its telling, its prose, and its multiple speakers elevates this into a magnificent literary accomplishment sure to be counted among Pamuk’s best work. Characters are fully rounded and believable and consistent in their being. Mevlut Karataş is one of the most memorable characters in recent memory, complete with the trials and joys any human being might encounter. Those who are familiar with Istanbul, one of the great cities of the world, will recognize and appreciate much of the geography described here and the role it plays in the development of the story.